This post by Andrea Eidinger originally appeared on Unwritten Histories. This post was inspired by a suggestion from Tina Adcock, and without her support and encouragement, it probably would have remained unwritten. So I would like to send her a huge extra-special thank-you. I would also like to thank the individuals who read and commented on previous versions of this draft, including Tina Adcock, Andrew Nurse, JonWeier, Chris Schultz, and Maj. (ret.) Peter Scales MA. A special thank-you goes to Christina Wakefield for supplying me with information about the 1921 Great War Veterans Association. Finally, many of the points raised in this blog post emerged out of online conversations about wearing poppies, both on Facebook and Twitter. I would like to thank everyone who participated for their contributions and for making this blog post much more nuanced. That is one hell of a loaded sentence, especially when we are still in the midst of Monument Wars. But it did make me start realizing that we don’t know very much about the poppy’s history as a symbol in Canada. Since I don’t like unanswered questions, I decided to dig a little bit deeper to see what I could find. In today’s blog post, we’re going to talk about what I uncovered, take a look at the history of the poppy, what it means to wear one, and how we learn from the past. The origins of the Remembrance Day poppy are pretty well known. If you’re like me, you had to memorize and recite “In Flanders Fields,” by Lieutenant Colonel John McCrae in elementary school. However, what happened after, particularly how they made the jump to Canada, that is rather unclear. I could only find one scholarly article, Deborah Nash-Chambers’ 2015 piece, “Memorializing Lieutenant-Colonel John McCrae Civic Commemoration and the 100thAnniversary of ‘In Flanders Fields,’” that dealt with the subject in any way. In it, Nash-Chambers connects the publication of a collection of McCrae’s poems in 1919 to a rise in the idea of the poppy as a symbol of remembrance. From there, two women, Moina Michael (who was American) and Anne Guerin (who was French) move to the centre of this relatively poorly known story. Michael was inspired to create the Flanders Fields Memorial Poppy Fund after reading a copy of McCrae’s poem, and she resolved to make and sell poppies to raise money for veterans. Guerin organized a group of French widows and orphans who made artificial poppies to sell, using the proceeds to support themselves. In 1921, she visited London and convinced the British Legion to purchase them. From there, disabled British veterans began to produce the poppies themselves. The symbol was then adopted by the American, British, and Canadian Legions, and the first “Poppy Day” was held in Canada and Britain on November 11, 1921.However, the article does not explain how the poppy made the jump from Britain to Canada. Nash-Chambers’ main source for this information was Bev Dietrich, then Curator at the Guelph Civic Museum (since retired), who also published her own piece on the subject “John McCrae and McCrae House: Keeping the Faith for Those Who Died,” in a local magazine; her main source of information appears to be clippings from the scrapbook of Jeanie Matthew McCrae (McCrae’s aunt), held at McCrae House.This same sequence of events was included in an article for The National Post on the history of poppies, by Jon Weier and Chris Schultz. Even Jonathan Vance’s book on the commemoration of WW I, Death So Noble, only contains a couple of references to poppies. He mentions a couple instances of poppies being used as a symbol in WW I writing, usually as a representation of the good memories of soldiers.I also checked Robert Rutherdale’s book, Hometown Horizons: Local Responses to the Great War. There is one mention of the poppy in this book, and it points to an article by Alan R. Young, ‘“We Throw the Torch’: Canadian Memorials of the Great War and the Mythology of Heroic Sacrifice.”In this piece, Young explains that “McCrae’s poem [has] stuck in the popular memory.”In the next sentence, he says he will explain why this is the case, but the remainder of the piece discusses the crucifixion motif in the mythology of heroic sacrifice. Christina Wakefield pointed me to a possible solution. A recently published book by the Thunder Bay Historical Museum Society, Thunder Bay and the First World War, 1914-1919, by Michel S. Beaulieu, David K. Ratz, Thorold J. Tronrud, and Jenna L. Kirker describes a visit by Anna Guerin to Port Arthur, Ontario. According to archival documents, a meeting took place between Guerin and the Great War Veterans’ Association at the Prince Arthur Hotel on July 4, 1921; Guerin argued that the Association should adopt a “poppy day.” Not only did the Association agree, but it also initiated Canada’s first poppy campaign the following November. This campaign sold poppies as both a symbol of remembrance and as a way for members of the public to financially support wounded soldiers. While this is really important information that helps us to understand how the poppies came to Canada, it also deepens the mystery. You see, the Great War Veterans’ Association is not the same thing as the Legion. The Great War Veterans’ Association was one of a number of veterans advocacy groups that sprung up in the immediate aftermath of the war. The Legion, on the other hand, was only established in 1925, and was an amalgamation of several of the previous veterans organizations, including the Great War Veterans’ Association. It remains unclear, so far as I can tell, why the Legion adopted the poppy and how the poppy came to be so indelibly associated with the organization. This is not simply a meander down historiographical memory lane, but an interesting perspective as to where our symbols come from and how the process of adopting symbols is — or, it seems, is not — recorded.. The fact that no one seems to know for certain exactly how the poppy was adopted is bothersome. There is a similar lack of historical research on traditions for Thanksgiving in Canada and Victoria Day. This makes me suspicious and raises a number of important questions: When I wear a poppy, what does that mean? What kinds of engagement with the past and present does it suppose? Can we remember past conflicts without wearing poppies on our breasts every November? Yes, but only on or very near Remembrance Day. All of the responses I received were incredibly thoughtful, and I think show how much care historians put into their work, both in terms of engaging with the past in public or in public-facing ways. But, I digress. While I’d like to say that people fell neatly into these categories, that’s not how life (or historians) work. Rather, I received a range of often divergent points. But there were some common themes. For those who choose to wear a poppy, most individuals cited a personal connection as a reason for wearing a poppy, usually to honour relatives (grandparents, mostly) who either served or immigrated to Canada as a result of war. A large group also explained that they wear the poppy to remember the horrors of war and in hopes of “never again.” And a surprising number shared that they wore the poppy out of a sense of obligation, usually because of their place of employment or because they are attending an event or ceremony for Remembrance Day. A number of individuals also explained that they wear beaded poppies by Indigenous craftspeople, as a way to recognize Indigenous sacrifices in the Canadian military, to make a particular statement about what they believe the poppy represents, as well as to support Indigenous veterans and the process of reconciliation. Individuals with these poppies, as well as more permanent or altered poppies (like a Mennonite Central Committee “to remember is to work for peace” pin) also do so as a way to start conversations about the contributions of Indigenous veterans, which continue to be under-recognized in contemporary Canada. Those who choose not to wear the poppy, or expressed reservations about wearing one, generally listed two major issues. First, a number of individuals expressed concern or dismay about the Royal Canadian Legion. Some said that they didn’t feel the Legion represented all veterans, and that they were mainly concerned with veterans of the two World Wars. Some also pointed to issues of representation and the treatment of Indigenous veterans as well as Sikh veterans and active soldiers. Expert Tip: As Duncan McCue noted in a recent piece, the Legion has a long history of exclusion. For instance, Status Indians were not able to consume liquor in public until 1951 under the Indian Act, and this prohibition lasted until the 1960s in some places. This meant that many Indigenous veterans were actually banned from Legion halls. Many non-Indigenous veterans gathered to drink in these halls, relying on each other for support, and getting help regarding post-war benefits. These places of knowledge and refuge were therefore not accessible to Indigenous veterans. For more on this, and the history of the beaded poppy, check out McCue’s piece here. Others were troubled by the fact that Legion maintains a copyright over the image of the poppy, and regulates its use as an image in Canada. In fact, Parliament granted the Legion a trademark on the poppy in 1948. The Legion argues that this is essential to preserve the poppy as a “sacred symbol.” A recent article by Sean Bruyea explains both of these concerns in detail, and I highly recommend reading it in full. I was particularly struck by the fact that the Royal Canadian Legion collected $16.5 million from poppy sales in 2014. Many other people explained that they are uncomfortable, angry, or dissatisfied with the symbolism of the poppy for two reasons: its recent association with militarization, and its representations of, or better, the political manipulation of, grief. A number of individuals expressed concern about the way that poppies have become increasingly seen as symbols of militarism and patriotism in Canada, particularly during the War on Terror and the years of the Harper administration. What’s more, in the media and the public’s imagination, the poppy has also come to be seen as a symbol of “supporting our troops.” A number of individuals also expressed dismay that some people interpret the wearing of the poppy as indicating that they were complicit with these narratives. A number of individuals referred to the politics of commemoration and poppy-wearing as reasons for their discomfort. These individuals noted controversies around the idea of wearing it “soon enough,” wearing it in the proper way, wearing a white poppy and risking confrontations over that choice, or not wearing a poppy at all. Expert Tip: For a humourous take on the increasing “prickliness” of poppy politics, check out this piece by Ian MacIntyre for The Beaverton. Finally, others have expressed concern about how poppies are used to represent, commemorate, or prioritize particular experiences during particular kinds of wars, rather than the general grief for what was lost. These individuals point to the many ways in which some of those who served are excluded from the narrative, such as doctors, nurses, ambulance drivers, engineers, artists, and so on. Others felt that wearing a poppy was akin to the tendencies of current narratives of commemoration to gloss over the horrors perpetuated by Canadian soldiers and the Canadian government, from the internment of Ukrainian-Canadian “Austrians” in WW I and of Japanese-Canadians in WW II, to the bombing of civilian centres like Dresden, to the many soldiers who came home with post-traumatic stress disorder. Finally, some felt that in wearing a poppy, they dishonoured those individuals who served. While they may have enlisted with the best of intentions, they did so in the name of and at the behest of a state that used them to enact violence both at home and abroad. This is particularly the case when discussing populations that were characterized as “enemy aliens,” including Ukrainian Canadians and Japanese Canadians. Many members of these communities chose to enlist as a way to demonstrate their loyalty as model citizens to a state that considered them to be suspect because of their ethnicity. Stories of honour and glory might have been acceptable in the immediate aftermath of wartime, but enough time has passed that we need to rethink these narratives, and perhaps to tell different, more complicated stories. What Does the Poppy Mean? If, by this point, you are feeling confused about what wearing a poppy means, you are not alone! As is so often the case, meanings shift over time, and symbols come to mean different things to different people. As I discovered , there are many contested, contradictory, and layered meanings of the poppy in the present day. But it begs the question: what was the original meaning of wearing a poppy and does it still apply? As far as I can tell, the original goal of encouraging people to wear poppies was to remember those who died in WW I and to help financially support wounded veterans. In this era, the government lacked the infrastructure necessary to provide complete and long-term support for veterans. While they did provide pensions and medical benefits to veterans, most of the support came from private initiatives, like the Canadian Patriotic Fund, started by Sir Herbert Ames.So fundraising initiatives like the Poppy Campaign were essential! Expert Tip: Veterans Affairs (now Veterans Affairs Canada) was not established until 1944. The fact that it exists at all is due to the presence of WW I veterans in Parliament and the government at the time, who wanted to prevent a repeat of what happened after WWI. But this is no longer the case. While less than perfect, sometimes tragically so, Veterans Canada provides the bulk of support for veterans and their families. What’s more, Canada’s last WWI veteran, John Babcock, died in 2010. So if the Legion no longer provides substantial financial support for Canadian veterans, and there are no longer any Canadian WWI veterans left alive, why do we still wear the poppy? What’s more, why do so many of us feel obligated to wear the poppy, and why is it such a sensitive topic? This brings us back to the Royal British Legion’s comment that “not commemorating past wars would mean we don’t learn from history.” This sentiment brings to mind the Monument Wars of the past two years, public discussions about naming and renaming, and the question of whether we should remove statues of problematic public figures. Many of those who have opposed the removal of statues of Sir John A. Macdonald often argue that if we remove these statues, we risk forgetting about the entire history of which he was a part, for better or for worse. Advocates of the removal of statues have often responded by saying that we shouldn’t keep statues up as aides-memoire. And, indeed, there is a problem with commemorating past wars or wearing poppies mainly because you are scared of forgetting that history. Of course, the simplest answer here is that there are still many veterans from WWII and other wars, and that the poppy is about remembering the sacrifices of all soldiers. But is it? In the public’s imagination, the two World Wars are often combined together as defining moments of the nation’s history, and the poppy is most often associated with veterans of these wars, for better or for worse. But in 2016, CBC reported that there were only 61,300 WW II veterans left alive, with an average age of 92. What will happen when all of these veterans are gone? So I think that maybe this is the time to re-examine what wearing a poppy means, why we feel obligated to wear one, and what this says about Canada as a whole. What does it say, in other words, when even our buses say “lest we forget,” or when we have Remembrance Day hashtags like #CanadaRemembers, complete with its own special emoji? To what extent has poppy-wearing become a performative act that is part of the larger mythology of being Canadian? When we look at the history and the historiography of the poppy, the answers are not clear. Perhaps one reason why the historical research is missing is because we have not yet come to question the origin of the poppy as a symbol; instead, many of us take it for granted. As historians like to say, there is a lacuna here that needs filling. Maybe losing poppies is part of memory as an active process of reshaping, refining, and remembering the past. Memory does more than connect past and present; it connects us to certain points and versions of the past that often change over time. Poppies, their wear and their loss, illustrate that memory is an active process that invites people to take on, or take off, messages and lessons from the past as they see fit, and as makes sense to them in their present circumstances. While I’ve focused specifically on poppies and poppy-wearing in Canada, it is important to note that this is an international concern. After all, people from the UK, New Zealand, and South Africa also have poppy-wearing traditions, and many other countries, particularly those with historical connections to the UK, have significant numbers of poppy-wearers as well. For instance, consider debates (particularly in Britain) about the white poppy. As I noted earlier, red poppies were originally intended as symbols of remembrance. However, in the UK, they were also closely associated with peace and pacifist thinking. However, beginning in the 1930s, just as countries began to remilitarize, red poppies took on an increasingly militaristic meaning, and were associated with other war memorials. 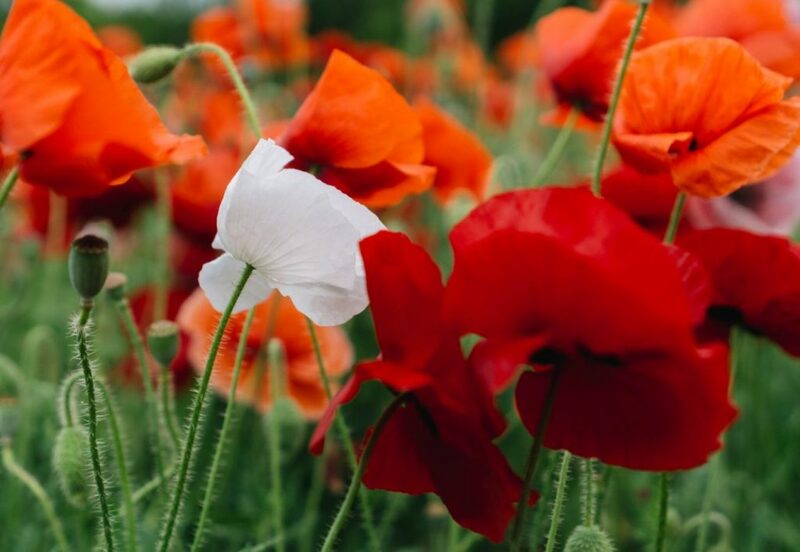 This shift spurred the popularization of the white poppy, which took on the original message of peace and pacifism. We can see this shift happen in real time by tracking the birth and evolution of the white poppy: the white poppy originated in 1926, emerging out of the No More War Movement in England, transforming from a centre pin for red poppies that said “No More War,” to the more familiar white poppy (which appeared in 1933) due in large part to the work by the Women’s Cooperative Guild, before being popularized by the all-male Pledge Peace Union in 1934.And yet, as we saw above, wearing a white poppy is still considered controversial. The white poppy campaign resists traditional narratives and traditions around Remembrance Day, and as such, it is seen (by some) as disrespectful of the past, history, heritage, and dead soldiers. This illustrates the ways in which public debates about ideas of collective memory and symbols are nothing new, that symbols are both inherently political and ever-shifting in their meanings, and that these debates are, and have always been, historical in nature. I have to tell you, this was a hard one to write, largely because of the sensitive nature of the subject; (also, that is why I am posting this after Remembrance Day.) But it also raises some fascinating questions about why we are so sensitive about WW I and its legacy, 100 years onward. Debra Nash-Chambers, “Memorializing Lieutenant-Colonel John McCrae Civic Commemoration and the 100th Anniversary of “In Flanders Fields””, Canadian Military History 24, no. 1 (2015), 371-373. The full citation is Bev Dietrich, “John McCrae and McCrae House: Keeping the Faith for Those Who Died,”Historic Guelph, The Royal City XLV (2006), 56. I can’t find it online in any case. In actuality, there are only two mentions of the word “poppy” and five mentions of the word “poppies,” and two of the latter are from McCrae’s poem. Jonathan Vance, Death So Noble: Memory, Meaning, and the First World War, (Vancouver: UBC Press, 1999), 65, 75, 76. Robert Rutherdale, Hometown Horizons: Local Responses to the Great War,(Vancouver: UBC Press, 2004), 307. Alan R. Young, ‘“We Throw the Torch”: Canadian Memorials of the Great War and the Mythology of Heroic Sacrifice,’ Journal of Canadian Studies/Revue d’études canadiennes 24 (1989/90): 18. Desmond Morton, Fight or Pay: Soldiers’ Families in the Great War, (Vancouver: UBC Press, 2008), 50-88. For more on the history of white poppies and current debates about them in the UK, please see: Jon Weier and Chris Schultz’ piece, linked above, as well as: “Remembrance and White Poppies,” Pledge Peace Union (website), accessed November 12, 2018; Kaya Burgess, “White Poppy Sales at Record High Before Remembrance Day,” The Times, (November 8, 2018); and Sam Edwards, “Why Not Wearing a Poppy for Remembrance Day is Always a Political Act,” Independent (November 11, 2018).